Chicken cutlets figure at the top of my brother's list of favourite foods - and not just any cutlets, but those made by us at Katy's Kitchen. These are fairly easy to make and as long as you're generous with the chicken and season the mix well you will get pretty good results. I often pack these in the hubby's lunch box and I like having a few of these in my fridge for days when I don't feel like eating a full meal. A warm cutlet sandwiched between two slices of bread makes for a lovely light lunch! Soak the bread in water and squeeze out as hard as you can. Break up the resulting lump into small pieces, as small as you can. Mince the onion, green chillies and fresh coriander as fine as possible. Mash the potato. In a large clean bowl mix the shredded chicken with the onions, chillies and coriander. Add the crumbled soaked bread, the egg and the dry spice powders. Mix everything properly. Add as much mashed potato as required to get a mix that will bind properly when you shape the cutlets. 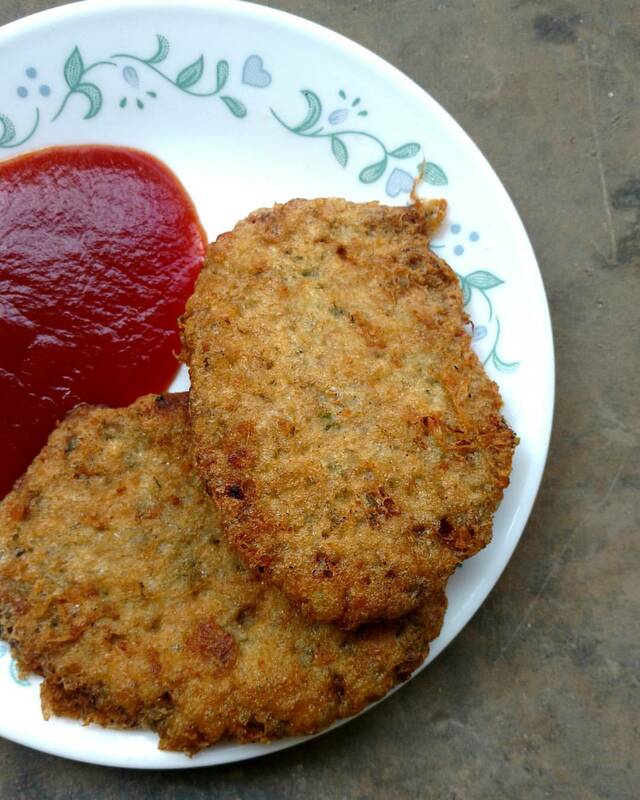 You can make this mix in advance and fry the cutlets when you want to serve. Store in a closed box in the fridge and use when required on the same day. Take bread crumbs in a flat dinner plate. Beat two eggs in a bowl. Start with two and only add more if you require them as you make the cutlets. Heat enough oil in a wok/kadhai to deep fry the cutlets. Make medium sized balls of the chicken mix and flatten to form a cutlet between your palms. Give the cutlet a neat oval shape and then place it on the bread crumbs. Pat gently into the crumbs to make them stick - do this on both sides of the cutlet. Make a few cutlets in this fashion and keep ready in a clean plate. When the oil is hot pick up a cutlet and dip it into the beaten egg. Turn to coat the cutlet all over with egg and then put it in the hot oil to fry. Fry on a medium flame till the cutlet is a beautiful golden colour. Do these one at a time just to be safe, especially if it's your first time making cutlets. Keep a bowl of water and a napkin handy to wash your hand and wipe before you pick up the next prepped cutlet for frying. This final process is a little fiddly and can get messy so make sure you have enough space to work in and have everything you need before you start frying. Serve the cutlets hot with a dollop of plain tomato ketchup.